Cold-water divers looking for total thermal protection in a comfortable high-stretch semi-dry wetsuit need look no further. Providing 7mm of neoprene plus an attached hood, the new SPORT 7MM HOODED SEMI-DRY delivers head-to-ankle protection yet is so soft and pliable it fits like a second skin. The SPORT 7MM HOODED SEMI-DRY is made from super soft neoprene that is ultra-comfortable and easy to climb in and out of. The suit uses water-blocking glued and blind-stitched seams and features a triathlon cut that allows for lots of range of motion in the shoulder and arm areas -- much more freedom of movement than you'll find in a traditional 7mm suit. The interior is lined with two plush materials that dry quickly, enhance warmth and feel so good against the skin you won't ever want to take this suit off. The external colored panels on the forearms and ankles are styled to appeal to fashion conscious divers, but they are more than purely design touches. The undersides of these panels seal against the skin to prevent water entry, and they are backed by zippered wrist and ankle closures that help keep water out and make donning and doffing that much easier. SCUBAPRO's Everflex is produced with X-Foam neoprene, an exclusive SCUBAPRO formula.SCUBAPRO was the first in diving in 2012 to introduce X-FOAM blend neoprene as part of our ongoing effort to better protect divers and our environment. All SCUBAPRO neoprene is X-FOAM. 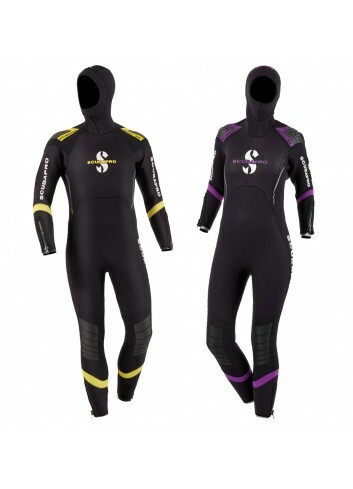 High-stretch neoprene is great for hard-to-fit divers who can now enjoy a suit that molds comfortably to his or her body. YKK Aquaseal main rear shoulder-to-shoulder dry zipper is super flexible for improved range of motion and prevents water from entering the suit. Double zippered seals at wrists and ankles are comfortable, improve flexibility, protect against water entry and simplify donning and doffing. Colored panels on the outside of wrists and ankles are design touches; on the inside they seal against the skin to prevent water entry. Glued and blind-stitched seams keep warmth in and water out.. Attached hood completes the total thermal protection system. semiseco scubapro sport 7 mm: Mergulhadores que praticam mergulho em água fria e encontrar um terno semi-seco confortável e de alta elasticidade que oferece completahan proteção térmica encontrou seu terno. Graças a neoprene 7 mm e o capuz integrado, a desova Sporto protecção da cabeça aos pés e é tão suave e flexível que se encaixa no corpo como uma segunda pele. Este traje é feito de neoprene Dive Espuma e inclui o corte undiseño Triathlon permitindo uma grande liberdade de movimento na área dos ombros e braços. Ao proporcionar uma maior liberdade de movimento respectoa outras roupas de mergulho 7 mm, o Sport fornece as necessárias térmicas Paratodos proteção mergulhadores que compram um terno pela primeira vez.